CBS News has learned that the FBI is investigating allegations surrounding the Russian doping scandal, someone familiar with the investigation told CBS News senior investigative producer Pat Milton. On Sunday, "60 Minutes" reported that the former director of the drug testing lab at the Sochi Winter Olympics knew of at least four Russian gold medalists who were using performance enhancing drugs. The director, Grigory Rodchenkov, was revealed to have admitted his lab covered up the drug tests results and that Russian intelligence was involved in the testing. The report by "60 Minutes" focused on Yuliya Stepanov, who not long ago was one of Russia's elite runners, and her husband Vitaly, who worked as a low-level employee with Russia's national anti-doping agency RUSADA. Together, as Armen Keteyian reported, they decided to bring down the systemic doping in Russia's athletic program by exposing it to the world. Their revelations sparked a World Anti-Doping Agency investigation into Russia's track and field team. Their report concluded that there was in Russia a "deeply rooted culture of cheating" that reached the highest levels of the government. It cost Vitaly Stepanov his job and forced the couple to move into hiding in the United States. One of the most explosive revelations came as Vitaly Stepanov detailed his contacts with Rodchenkov, who also fled to the U.S. after being fired by the Kremlin following the WADA probe. After arriving in the U.S., Rodchenkov began giving Vitaly Stepanov information that broadened the scope of Russia's alleged doping, including the claims about the four Russian gold medalists from the Sochi games. 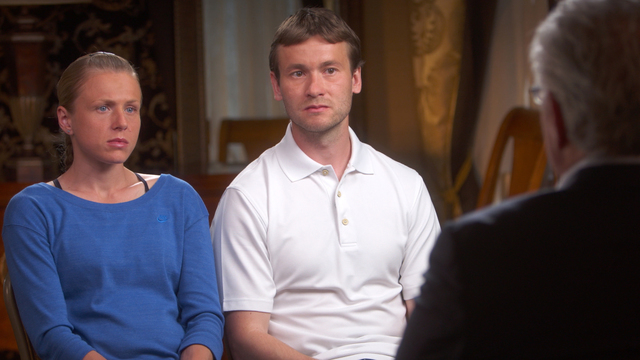 Stepanov recorded those conversations and shared them with "60 Minutes." World Anti-Doping Agency spokesman Ben Nichols said Monday officials from the agency watched the "60 Minutes" report, "which revealed new and very disturbing allegations regarding Russian doping in sport. We will look into these without delay." Russian Sports Minister Vitaly Mutko on Monday dismissed the new allegations as speculation.